BC Passive House is a manufacturing company that prefabricates passive timber-frame building systems. Completed in the summer of 2014, the company’s new factory is an ‘all wood’ demonstration project designed to exemplify the firm’s commitment to wood design and sustainable construction. The building, designed by Hemsworth Architecture, consists of a large open workspace divided into two distinct bays used for manufacturing, plus a conference room and office mezzanine to the southwest, where 360-degree clerestory windows provide natural daylight and spectacular mountain views. The mezzanine offices, support spaces and showroom were designed and built to meet the passive house standard, with space heating demand of 14Wh/m2/yr. The building’s envelope was constructed using BC Passive’s wood-based, double wall, super insulated system that is airtight while remaining vapour diffusion open to the exterior. Blown cellulose recycled paper was used for insulation, and while a final airtightness test has yet to be completed, BC Passive House expect a result of around 0.3 air changes per hour. 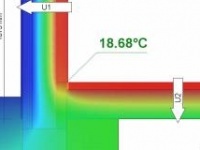 The open workspace has different heating requirements to offices, only needing temperatures of 10-15C. Here, a biomass boiler uses wood waste from manufacturing to deliver heat through an underfloor radiant system. The use of these prefabricated structural components allowed for the building’s superstructure to be set-up onsite in just eight days. In addition, prefabrication allowed for the construction of the building components in a controlled environment — increasing efficiency, quality control and precision while reducing exposure to weather. The building’s exterior was finished in fir and larch that was left untreated, with the intention that it grey with each passing season. This provides a natural, VOC free, no maintenance solution. Products and materials were chosen for low environmental impact. The conference room was finished with cedar milled from trees salvaged from a 1930s burn site. Plant storage, desks, shelves and staircases were constructed from waste CLT panels, while pumice and recycled foam glass insulation were used for under-slab insulation. Adopting a wood first approach for the structure of the building also avoided approximately 365 metric tons of CO2 emissions, according to the woodworks.org carbon calculator. In 2011, the Holm, an interdisciplinary research centre working in the logistics and mobility sectors, tendered for the construction of a new research centre in the Gateway Gardens district near Frankfurt Airport, which AS & P — Albert Speer & Partners — won together with project developers Lang & Cie Real Estate AG. Now completed, this passive-certified building is seven-storeys high, with two more floors underground. Shaped like a figure of eight, the building’s architecture is designed to support the networking and open exchange of ideas between its users. The design features a bright sevenstorey atrium, at the heart of which is a flight of stairs dubbed the ‘X-Celerator’, which forms the centrepiece of the building. Meanwhile the walls are constructed from externally- insulated precast concrete with a ventilated facade, while the roof is built from reinforced concrete too. The building is hooked up to the local district’s combined heat and power network, which supplies heat via low-temperature ceiling panels. 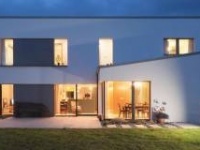 With passive house design by Lenz Weber Engineers, the building’s vital stats tick all of the right boxes: airtightness of 0.27 air changes per hour, space heating demand of 14kWh/m2/yr and primary energy demand of 115 kWh/m2/yr. And as well as passive house certification, the building also boasts a ‘silver’ certification under the German DGNB scheme. And we think it looks pretty damn good, too. This passive-certified family home in Gerasdorf, just outside of Vienna, is the second project we’ve featured by leading Austrian passive house architect Thomas Abendroth. This contemporary house’s walls are constructed from poroton fired-clay blocks with 400mm of polystyrene insulation externally, while the roof is insulated with polystyrene too. 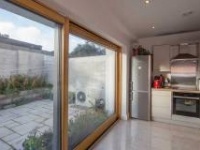 The dwelling also features triple-glazed Internorm windows. The house’s southerly orientation is ideal for passive solar gain, while there is no glazing whatsoever on the north facade. Meanwhile a timber screen helps to shield the house from the street, and encloses the private roof terrace too. The house has a Drexel & Weiss compact Aerosmart unit that provides heat recovery ventilation, and domestic hot water via a micro heat pump. There’s also a heat exchanger buried in the ground that pre-heats incoming fresh air using the earth’s nature heat, before the air is pumped into the house. 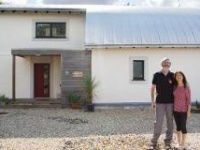 This 281 square metre house has a space heating demand of 15kWh/m2yr, heat load of 9.5 W/m2, and airtightness of 0.3 air changes per hour. These might be fairly standard specs for a passive house today, but this house is nine years old now — meaning it was quite ahead of its time when it was built in 2006. This speculative passive house was developed on a long-vacant lot in a Philadelphia neighbourhood undergoing a flurry of construction at varying scales and standards of quality. With so much new construction on the market, the challenge was to significantly raise the quality of construction without pricing the home out of the neighbourhood. To maintain an aggressive sales price of $325,000 for this 2,000 square foot, three-bedroom home, designers Re:Vision Architecture and builder/developer Mark Hutchinson of Archetype Properties (also a passive house consultant) put a lot of emphasis on keeping construction details simple. Costs were shaved by sharing one set of supply ducts for both the Goodman mini-split heat pump and the Zehnder heat recovery ventilation system. The passive house details were a key factor in the quick sale. In fact, the buyers included a clause in the sales contract that the home must achieve airtightness of 0.6 air changes per hour. Thankfully the final blower door test result came in at 0.5, and the house was certified by the New York office of Ireland’s Passive House Academy. This all electric home is extremely comfortable year-round, with total utility bills averaging just $50 per month.